You got a good night’s sleep. You’ve been eating well and exercising. Still, when you wake up and look in the mirror, there are those dark circles under your eyes. What is causing them, and what else can you do to reduce the appearance of them? Dark, under eye circles can affect anyone at any age. Believe it or not, dark circles actually come in two colors—blue, or brown. Blue: These are more common and show up when blood pools beneath the skin under the eyes. Since the skin here is so thin, it easily shows the blood underneath. We see this more clearly in the morning because we were horizontal for several hours, which causes fluid to accumulate. Aging also makes these more visible, as the skin under the eyes thins. Allergies can also make undereye circles more prominent. Brown: These are dark spots caused by aging or environmental stressors. This are more common in Asian and African women. Depending on which type you have, you’ll want to adjust your treatment. First, take a look at your daily diet. We are what we eat, as they say, so make sure you’re consuming plenty of fruits and vegetables, as they give your skin the nutrients it needs to look its best. Drinking alcohol and smoking cigarettes can wreak havoc on your skin, and may also contribute to dark circles, so if you’re serious about getting rid of them, try to quit smoking (if you smoke) and limit your alcohol consumption. Too much caffeine can also disrupt sleep, which can leave you with dark circles in the morning. If you have stubborn dark circles that don’t seem to response to anything, check with your doctor. Dark circles can be a symptom of liver or kidney disease. Hypothyroidism, insomnia, mononucleosis, and certain infections may also be to blame. Apply eye cream at night. This helps hydrate and maintain the skin under your eyes, and if you use our Anti-Aging Eye Cream, it will also help keep the skin looking tight and firm so you keep more of that volume you need. Brighten. Try a little of our Citrus Stem Cell Serum under the eyes at night, then be sure to always protect your eyes from the sun during the day. Sunglasses are best, and the natural antioxidants in our Anti-Aging Eye Cream are also protective. Use pineapple juice. Pineapple naturally can help reduce the appearance of dark circles. Try mixing a few teaspoons of fresh pineapple juice with a pinch of turmeric powder, then apply the past for about 5-10 minutes and wash off. Be careful not to get in the eyes. Apply every day for a couple weeks and see if you notice a difference. Make a tea compress. For those with brown circles, you can brighten your look with tea from licorice root and chamomile. Brew the tea, let cool, and soak compresses in the tea and place under the eyes for 5-10 minutes a day. Cucumbers may work. 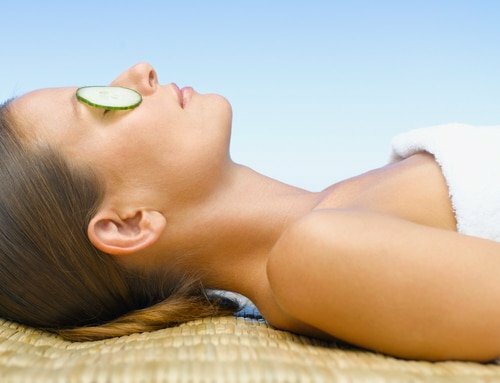 We have cucumber in our Anti-Aging Eye cream because of its great benefits for the eyes. You can also try mixing cucumber juice with lemon juice in equal quantities, then applying in a compress for about 15 minutes. Cotton with rose water. Rose may help reduce the look of puffiness that comes with some dark circles. It’s also a great source of vitamin C, which helps keep your skin looking tight and firm. Simply dip some cotton balls in chilled rose water and set on the eyes for 10-15 minutes. Almond oil and lemon juice mask. Mix one tablespoon almond oil with one teaspoon lemon juice, soak a compress and apply for ten minutes before bed. Both ingredients are great sources of vitamin C and key minerals. The acid in the lemon can also help to smoothe, which can be helpful in brightening your skin's look. Mint leaves and tomato juice. The mint is cooling. The tomato is acidic and can help too. Crush the mint leaves and mix with tomato juice and apply in a compress, or mix mint leaves past with tomato juice and apply directly. Allow to sit for 5-10 minutes, then rinse. Conceal: Makeup is your friend when it comes to dark circles of any color. Choose a mineral based foundation or concealer that matches your skin tone (not too light or too dark), and tap with your ring finger from the lash line down in a triangular shape. A liquid formula will work for mild circles. If you have serious discoloration, try a cream. Always check the brand to make sure the ingredients are nourishing and safe. You don’t want to apply potentially toxic ingredients under the eyes, as they can make your dark circles worse. Protect. Everyone needs to protect the skin from the sun, but if you’re prone to brown circles, it’s even more important for you. Just be careful as you apply around the eye area. Look for a sunscreen safe for the skin around the eyes, and pat lightly with your ring finger. Do you have other natural solutions for dark circles? Please share with our readers. A very well-researched article. I have read many articles about dark circles, but had no idea regarding the blue dark circles. These natural home remedies would be very helpful. Thank you! I have recently started showing bags under my eyes, along with creases. Istarted using your anti eye cream, but no change. Do you have any helpful tips that I can use along with the eye cream? For under eye bags/puffiness/dark circles, there are many possible causes for this. -i’m interested why health and beauty consultants always fail to bring up root causes. The eyes and skin are two of the first areas that reflect health problems.